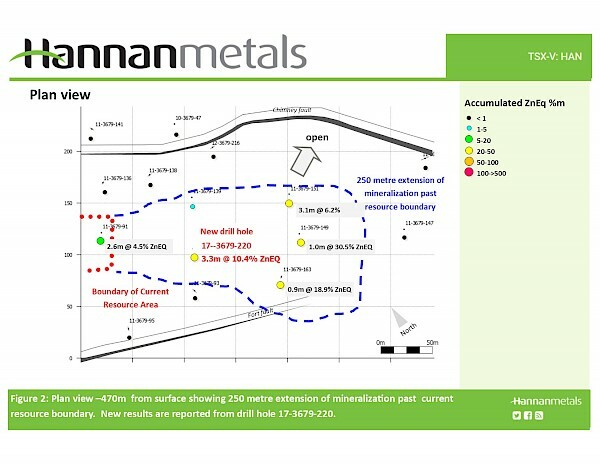 Vancouver, Canada – Hannan Metals Limited (“Hannan” or the “Company”) (TSX.V: HAN) (OTCPK: HANNF) is pleased to announce results from a further two diamond drill holes completed as part of a resource expansion program at the 100%-owned Kilbricken zinc-lead-silver-copper deposit in County Clare, Ireland. To date, five holes have been completed by Hannan at Kilbricken, and one in progress for a total of 4,160 metres. 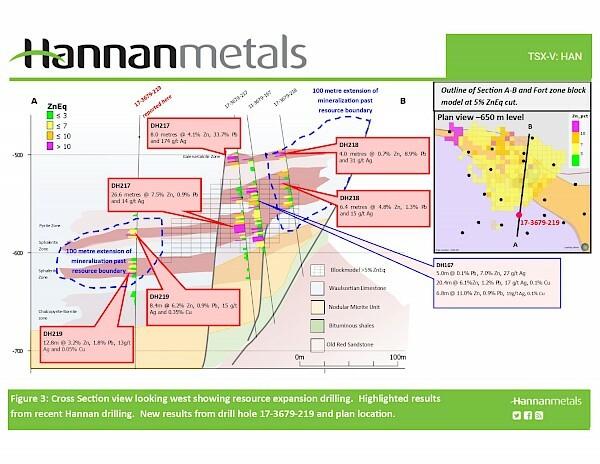 A 6,500 metre resource expansion drill program is ongoing, with two drill rigs now at site to test along strike and down dip from the mineral resource area (Hannan Press Release, 10 July, 2017 ). Drilling will continue through to Q1 2018. In addition to above, hole 17-3679-221 (“DH221”), a 150 metre step-out from the Fort Zone, was completed at 763.4 metres depth and is now being logged and assayed. Hole 17-3679-222 (“DH222”), a 800 metre step-out from the Fort Zone and 150 metres down dip from the Chimney Zone, remains in progress. Hole 17-3679-223 (“DH223”) a 500 metre step out to the north of the Chimney Zone, targeting shallower mineralization identified by recent soil sampling, remains in progress (Hannan News Release Oct. 10, 2017). (Figure 1, Table 2). 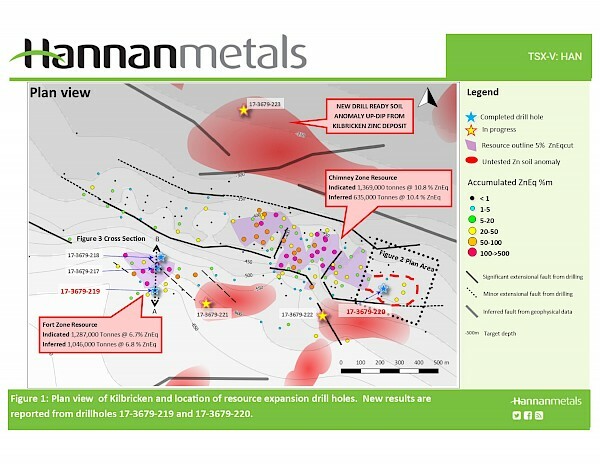 The maiden mineral resource for Kilbricken was published on July 10, 2017, and immediately ranked Kilbricken as one of the top ten base metal deposits discovered in Ireland by tonnes and grade. Total indicated mineral resources were calculated as 2.7 million tonnes at 8.8% zinc equivalent (“ZnEq”), including 1.4 million tonnes at 10.8% Zneq and total inferred mineral resources of 1.7 million tonnes at 8.2% ZnEq, including 0.6 million tonnes at 10.4% ZnEq. Importantly, as DH218 shows, the initial resource is expandable at all scales, from near-resource to prospect scale. A diamond drill rig from Priority Drilling Limited with water recirculation and drill cuttings collection systems was used for the drill results reported here. Core diameter is NQ2 (50.6 mm). Core recoveries were excellent and average close to 95-100% in fresh rock. After photographing and logging, core intervals averaging 1-2 metre for mineralized samples were cut in half at Hannan’s core facilities in Ennis, County Clare, Ireland. The remaining half core is retained for verification and reference purposes.